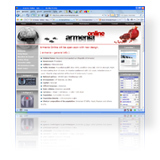 Taxation in Armenia - Profit tax .:.::. Under the Law on Profit Tax both residents and non-residents pay profit tax in the RA. Legal entities are deemed to be residents if they have received state registration in Armenia. Non-residents are legal entities and enterprises without legal entity status, which have been registered in another country, including international organizations. Residents are taxed on profit derived both in Armenia and abroad, while non-residents are taxed only on income within the RA. Non-residents operating through subdivisions in Armenia are taxed on profits earned from the activities in Armenia. Income received by non-residents from other sources in Armenia, e.g. dividends (for enterprises only), interest income, royalties, rental income etc. is subject to withholding at the source. Withholding may be reduced or eliminated by applying double taxation treaties. The annual profit tax rate is 20%. The law may establish, for certain payers, groups of payers and types of activity, a fixed payment, which substitutes for profit tax. For non-residents, for income from insurance compensations, reinsurance payments and incomes from freight the rate is 5%. For incomes received as dividends, interest, royalty, income from the lease of property, increase in the value of property and other passive incomes, as well as other income received from Armenian sources the rate is 10%. The taxable profit is the positive difference between the gross income and the deductions allowed under the Profit Tax Law. Income and expenses shall be accounted for using the accrual method. amounts of accounts payable written off, etc. research and development expenses, etc. expenses on services rendered by the taxpayer, which are not related to the production of goods, etc. Profit tax payers may apply other depreciation rates within the above rate limits. Depreciation is calculated on the initial cost of the assets on a straight-line basis. The depreciation term of intangible assets is specified by the taxpayer on the basis of the possible period of effective use. In the case of being unable to determine such a period, the minimum depreciation period for intangible assets should be not less than 10 years. Gratis assets are considered as an income only in the period when they are recognised as an expense or loss. It does not apply to non-residents. Dividends received by residents are not taxed. Dividends, received by non-residents are subject to withholding tax, except for cases when the following 3 conditions are met: shares have been owned for no less than 2 years, the non-resident during the previous 2 calendar years from the date of the payment of dividends owned no less than 25% of the capital and the dividends are not subject to tax in the resident country. The profit tax law allows for losses to be carried forward for 5 years. An enterprise that incurs a loss in one accounting year may carry it forward to be offset against profits earned in subsequent years. This does not apply to non-residents. Tax payers involved in agricultural activities are exempt from profit tax on revenue received from selling agricultural products, as well as on revenue derived from the sale of fixed and other assets, if the relative weight of the latter does not exceed 10% of the gross revenue. Profit tax is calculating by the taxpayer independently, using appropriate rates and tax privileges. Taxpayers must file a tax return and an annual report to the local authorities by 15th April following the end of the tax year. Profit tax must be paid to the state budget before 25th April following the end of the tax year. Advance payments shall be made monthly, if the amount of profit tax paid by residents exceeded AMD 500,000 in the previous year. These payments are based on 1/16 of the actual profit tax paid during the previous year. Payments are made before the 25th day of the current month. Newly registered taxpayers do not have to make advance payments of profit tax until April 25 of the following year. Non-residents shall submit a tax return on annual income to the Tax Inspectorate prior to April 15th of the year following the reporting one. Within 10 days the taxpayer receives a payment notification about the final amount of the calculated profit tax, which should be paid within one month after receiving the notification. Non-residents must pay advance payments twice a year if the amount of profit tax paid during the previous year was greater than AMD 2 million. These payments are based on 1/4 of the actual profit tax paid for the previous year. Payments are made before1st July and 31st December of the reporting year. A non-resident taxpayer who is carrying out a business activity in Armenia through a subdivision or place of business is taxed on income derived from Armenian sources connected with the subdivision or place of business. The tax is reduced by the amount of deductions established by the Profit Tax Law for resident taxpayers, except gratis assets, loss carryover and dividends received.